"These delicious appetizers are perfect for a Mexican-style meal. 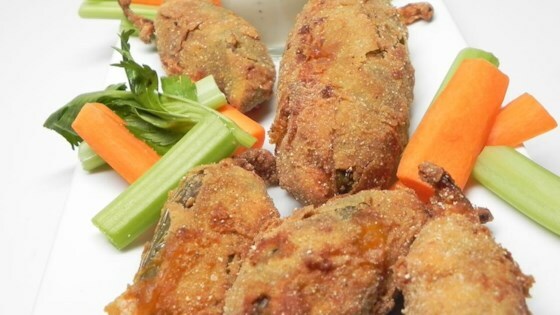 Pickled jalapeno peppers are stuffed with Cheddar cheese, then fried until crisp. Serve with sour cream." Cut a short slit into each jalapeno pepper. Remove as many seeds as possible. Slice Cheddar cheese into approximately 1/4 inch by 1 inch strips. Stuff each jalapeno with a Cheddar cheese strip. Place beaten eggs in a small bowl. In a small dish, mix yellow cornmeal, flour and salt. One at a time, dip jalapenos in the eggs. Roll in the yellow cornmeal mixture until well coated. Arrange on a metal rack, and allow them to sit approximately 30 minutes. Heat corn oil in deep-fryer to 375 degrees F (190 degrees C). In small batches, using a slotted spoon, lower peppers into the heated oil, and fry until crisp and golden brown, about 4 minutes. Drain on paper towels. this is a great recipe if you like spicy food!!!! Yummy! As I post this I am munching! I too will try will cornmeal masa and used the soaked toothpick trick. My son's are bomber addicks and love this! I made these and they are wonderful!! Very time consuming, so then next time I wanted them I put the peppers in the blender added the cheese and made quesidellas. That was yuum! !